Dressed in an White Cargo and Core Black color scheme. 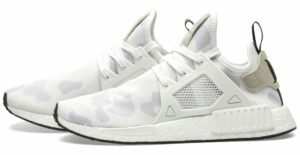 This adidas NMD features a full white Duck camouflage print throughout its upper. The shoe also includes White tones throughout, along with a black heel tab to give it that ideal look for the colder months. Completing the look is a White Boost midsole, White EVA insert overlays and matching Black rubber sole.